Well folks, Bellbottoms is the rock'n roll band you've all been waiting for! Hurriganes reunion, CCR are making a comeback and Peter Green is back with the Fleetwood Mac, that's the spirit of Bellbottoms. We've been rockin' up and down the Finnish West Coast for some years now and if you haven't had the chance to check us out, then go to your local rock'n roll bar and rough up the owner a little bit so he'll bring us to your favourite stage! The story of Bellbottoms goes back to '92 when Johan and Daniel started out jammin' Hurriganes- and CCR-tunes. The paths have been many and windy since then, but in the summer of '98 they finally decided to set the record straight and backed up by Jonas and Ronny on the rhythmsection they started rockin' seriously again as Bellbottoms. Over the years many rock'n'roll standards have been nailed down and in the end of year 2000 they decided to capture some own written tunes on record, so finally in February 2002 their first single with three own tunes was ready. In the middle of August 2002 a new era begun for the members of Bellbottoms as leadguitarist Johan Engström moved to Sweden and joined a school for studiomusicians. Tom Forsman was contacted and soon the band was jammin' again as Bellbottoms, mark II. After touring around Finland the band decided to record a full length record. 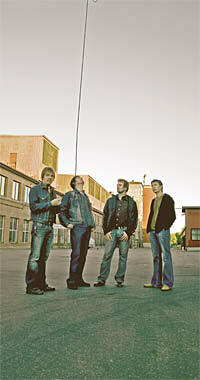 In January 2004 they begun the recordings of their debut album and finally in May 2005 it was ready for mixing. The band chose to look for professionals who know what a rockband with strong rootsinfluences is all about, and contacted producer Kalle Gustafsson Jerneholm (Soundtrack Of Our Lives, 22 Pistepirkko) at Svenska Grammofonstudion. He immediately became interested after listening to some raw mixes. The album was mixed in June '05 in Gothenburg, Sweden, with Kalle and Hans Olsson (Silverbullit, Timo Räisänen) behind the mixing desk. Three tracks were additionately mixed by the band's guitarist Tom Forsman in July '05.